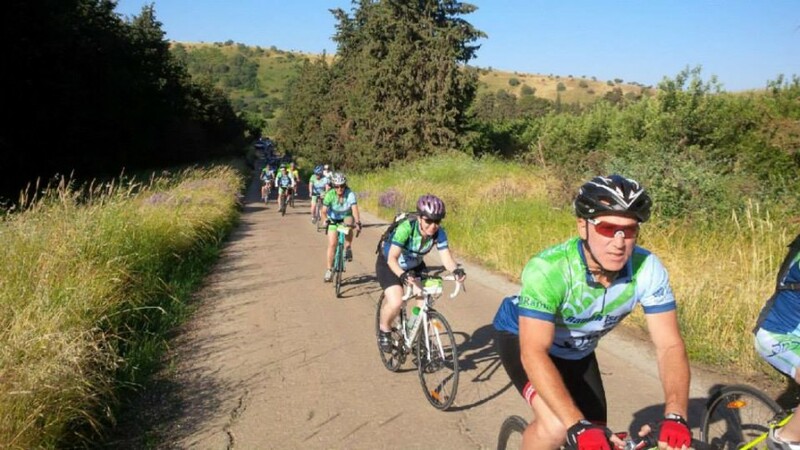 The 2015 Ramah Israel Bike Ride came to a successful conclusion today, as all three biking groups arrived safely at Kibbutz Ginosar just north of Tiberias. There was a great cheer tonight when I announced that we had raised $425,000 for our summer camp inclusion programs for campers with disabilities. Some participants said they would still seek support so, we will keep this process open until June 30. Equally amazing is that all the participants, 114 people, will go home as ambassadors for Tikvah and spread the word about these inspiring programs. We began our final day with a very early start as an intense heat wave brought temperatures to well over 100 degrees. Some rode for 45 miles, others for 58 miles, just short of a metric “century ride.” We rode along the plateau of the Golan Heights, stopping at Gamla, an incredible ruin of a Herodian fortress from ancient times. We began our descent toward the Kinneret (Sea of Galilee) and rode carefully down steep hills with amazing views of the sea and the surrounding towns and villages. After lunch at Kibbutz Ein Gev, some of us enjoyed a boat ride across the Kinneret, viewing the shores which include modern towns, ancient ruins, and holy sites for Muslims, Christians, and Jews. And tonight, at our closing ceremony, we expressed tremendous appreciation for this wonderful week of adventure and our hard-working staff, as well as the opportunity we had to support special needs programs and the State of Israel. Many thanks to all our participants, staff and supporters.